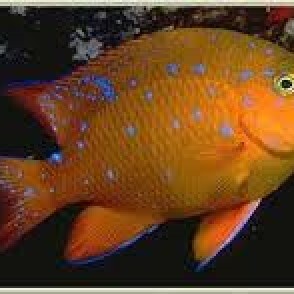 The Garibaldi Damsel comes from the cool waters off of the coast of Southern California and Mexico, and is one of the largest fish in the damsel family. 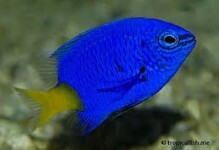 The Garibaldi is a striking color of orange, and as a juvenile is marked with many blue spots. The fins of the juvenile are also outlined in blue adding to its beauty. 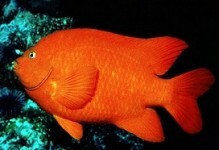 The Garibaldi Damsel grows very large and is an extremely long lived fish, with a lifespan of up to 25 years. This fish requires an aquarium of at least 125 gallons with plenty of live rock for territories. 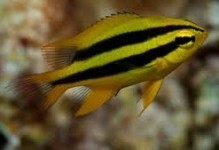 They are extremely aggressive towards their own kind, and only one of this species should be kept in the same aquarium. 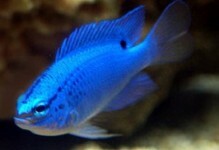 The Garibaldi Damsel is sexually dimorphic with the males taking on a larger size and exhibiting a lobe on the front of the head. These fish have not been successfully bred in captivity. The diet should include various meaty foods, herbivore preparations, and flaked foods.